LUKE AIR FORCE BASE, Ariz. — In an Air Force where being a leader at all levels is highly encouraged, it is becoming increasingly disturbing to me that people just do not seem to care. 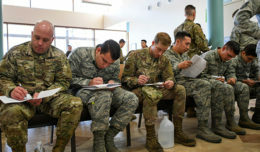 They are so focused on their particular area of responsibility, that when something new or unknown arises, they routinely brush it off as “not my problem.” While this obviously does not apply to all Airmen, I find myself more frequently having to resolve issues not necessarily related to me because someone else decided it was not their problem. Much like the famous inscription on President Harry S. Truman’s desk, I believe that “The Buck Stops Here.” I fully accept responsibility for the actions of my Airmen and take every opportunity to mentor and guide them through an ever more demanding Air Force career. I do this because I care and because it is my problem. 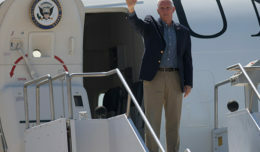 Recently, the Chief of Staff Air Force gave a speech at Luke during which he said we need to care more. He expounded by saying that we need to take a personal interest in those around us. Not just their military life but their personal life as well. I support his statement fully. 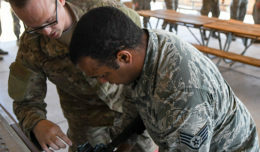 Airmen are constantly looking for a leader, mentor and friend. While these roles traditionally seem contrary to being a military leader, it is absolutely necessary when promoting professional development. As an NCO, I’m sure you have heard at least once that a subordinate is not your friend. You have been told that being friends represents an unprofessional relationship. Well, I’m hear to say, that line of thinking is outdated and wrong. You should know the Airmen around you like you know your friends. Not only will this help you identify with them but it will help them identify and feel comfortable with you. This sense of comfort can make a difference for Airmen who may be facing tribulations and whether or not they decide to confide in you, or as is often the case, no one at all. I have always shared relationships with my mentors that were more profound than simply working together. They have always genuinely cared about my welfare and not just my duty performance. They have counseled me on everything from enlisted performance reports to which quarterback to take in my fantasy football draft and they continue to mentor me to this day. I know they care and that’s why I listen. John C. Maxwell said, “People don’t care how much you know until they know how much you care.” So I encourage everyone to take the time to ask the people you work with how they are doing more often. Then, over time, you will know when they are having a problem. Don’t be surprised when they confide in you or ask for advice. They do it because they know that their problem is your problem too.